At the moment 1930s reproduction clothing is limited in choices. I expect a 1930s revival to happen in the next few years, but for now it is a forgotten decade. If you want to create a 1930s outfit, you will either need to buy vintage (ouch$$) or sew your own. The first step to sewing your own 1930s clothes is to pick out a sewing pattern, and then the fun part really begins: the 1930s fashion fabric! The following is a guide to popular 1930s fashion colors, fabrics and prints that should help you locate a good thirties fashion fabric to begin your project. There was little change in fashion colors during the 1930s. In spring and summer, women gravitated towards saturated pastels such as peach, rose pink, lilac, sunny yellow, sky blue, and sea green. Add to that year round colors of red, navy, emerald green, orange, and mustard. For winter, chocolate brown, grey, tan, rust, and black were warm and rich. 1934, note the amount of white in the cotton prints and white eyelet embroidery on the batiste. 1930s fashion color combinations were often contrasting but rarely as clashing as the 1920s. Blue and pink, yellow and green and tonal variations such as red and pink or brown and tan. There was one color, however, which was combined with all other colors: white. White was the base for many pattern fabrics, from gingham checks to stripes and floral. Red flowers outlined in white, blue dots on white, white embroidery on a solid net. This wasn’t something I noticed until I began to look through the many examples of fabrics sold in the 1930s. White was everywhere. Perhaps is was an economical way to save on dying white fabric. Or perhaps white gave hope during difficult times. If a solid color was worn, you bet an accessory of white gloves, belt, purse and hat was worn, too. White collars on dresses and blouses and white trim around cuffs and necklines were also added to most house dresses and many afternoon dresses. White wasn’t just for spring and summer either. White was a year-round color. With the stock market crash limiting budgets, modesty back in style, and home sewing being the most common way to acquire new fashions, women turned to the department store or mail order catalog for fabrics. The cost of materials was usually much lower than the cost of ready made clothing. For example, a basic cotton print was 25 cents per yard in 1934, which is about $4.48 USD today. Assuming 3 yards of fabric is needed, the total cost for the dress fabric is about $15. A new ready made, simple house dress cost $1.29 or about $23 today. The savings is not great, but combined with upcyling old dresses and reusing old trim, a new homemade dress could and did mean substantial savings. Most fabrics for summer and winter were light and airy. Cotton, rayon and silk were each woven into fabrics that were quite often sheer enough to require a full slip or a lining to be used. Cotton voile was one of the cheapest of the nice options, costing about $2.88 today. Rayon was a little pricier at $7.80 a yard. Silk was about $15 a yard. Crepe, the favorite fabric of the decade, ranged from $10-20 a yard. Cotton: Cotton came in an assortment of different weights. As a natural fiber, it took dye and printing well, was washable, durable, and breathable in hot weather. It was also prone to shrinking and fading in the sun. Types of cotton available were broadcloth, cotton suiting, foulard, covert, percale, lawn, batiste, and pique. Dimity: a semi-sheer, lightweight cotton made into dresses and bed linens. It has a slight texture of rows (called corded below). It takes a nice, fine print well, especially on a white background. It is prone to wrinkling, but that gives it some personality as well. Linen: Linen is one of the best summer fabrics for its breathability. It is a heavier weight compared to most summer cottons, and it can wrinkle very badly, but in hot climates it is a must. Linen is always a solid print in a light color such as this butter yellow with white embroidered flowers. Crepe: Crepe was the perfect ’30s fabric. It was light, flowing and draped nicely, but it was also thick enough to avoid the sheerness issues of cheaper fabrics. It had many subtle textures from smooth (flat crepe) or pebbled. It could be made of rayon, silk or cotton or more likely a blend of them. Crepe fabric came in solid prints and floral prints in rich colors. Several of my 1930s catalogs included swatches of crepe. Pongee: Silk pongee also called tissue silk or Japanese silk is a lightly textured fine silk most often used in lingerie, pajamas, blouses, Japanese kimonos, and robes. Cotton pongee was also available but not as fine as silk. Solid colors in light pastels and pretty prints make this a dreamy fabric for the boudoir. Voile: Light and airy, voile is one of my favorite ’20s/30s fabrics. It breathes in warm weather, drapes nicely and is surprisingly durable for its delicate feel. Voile came in plain colors and some small prints. Being flocked with dots and flowers in white provided some texture to otherwise smooth fabric. Lawn is a similar fabric made of linen or cotton. Dotted Swiss is also similar except the dots are woven instead of printed. It was not always just dots. Small flowers and fruit were also popular. Because of its sheerness, an under layer of cotton backed the swiss. Wool: Wool was the ideal fabric for winter weight clothing, coats and menswear. Like cotton, it could be turned into a number of different styles of fabrics. It was thick, warm and often scratchy. It was always a solid color in a flat or textured weave. Wool was often blended with cotton or rayon to make it cheaper, thinner, softer and shrink resistant. Chambray: used prior to heavy blue denim found in women’s fashion in the early 1940s. Sportswear, workwear, children’s clothes, and suits used Chambray, a lighter version of denim. Solids, narrow stripes and wide stripes of multiple colors were all offered. Most colors were light since the weave on white made dark colors speckled and faded instead of solid. Stripes were usually placed vertically. Corduroy: Corduroy in the 1930s came in fine grooves of solid colors, although patterns were increasingly popular as well. As a medium to heavy fabric it was used for suiting, winter sportswear, children’s clothing and accessories like handmade hats and purses. Tweed: The tweed weave was an especially popular wool or wool blend winter material used in suiting, outerwear and sportswear. It was woven into textures such as chevron, checks and waffle. It could also be printed on, although the designs were small and muddled in appearance. Frugality was set aside when it came to evening fabrics. Anything shiny was in, including sparkling paste jewelry. Satin reflected light, taffeta glimmered and even velvet reflected some shine. Evening colors were heavy in gold, peach, emerald green, black, brown, red, and copen blue. Silk: Although quite expensive, silk was still used in evening dresses and gloves. Blends of silk such as silk-satin or silk-taffeta created a thicker, shinier fabric that the ’30s embraced. 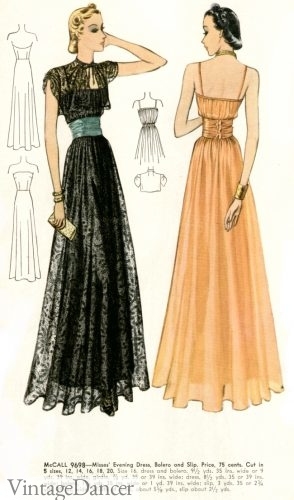 Sateen: Satin and sateen were the most popular evening fabrics for bias cut gowns. They draped beautifully, wrinkled little, clung to the body and were not as delicate as pure silk. Plain color satin was preferred in eveningwear. It was equally popular as a lingerie fabric. Taffeta: While I don’t personally like taffeta, it was a good, affordable fabric for evening gowns that needed some body without layering. It was light yet stiff, making it ideal for folds and ballgowns. The shine made it shimmer in dim lights. Taffeta could be made from silk, cotton or rayon. Net: For ballgowns and dresses with the most body, a net layered dress (over taffeta) kept a dress light and full. Net was often bedazzled with sequins or ribbon work. Velvet: Year-round, but especially in cooler months, velvet was a luxurious evening gown material. It ruched well (see below) and draped with a shine. It was heavier than other fabrics but buttery soft and oh so divine! Can you tell I LOVE vintage velvet. Modern velvet is heavy, stiff, nasty stuff. Lace – After an almost 10 year hiatus from fashion in the 1920s, lace returned with vigor in the 1930s. Lace was used for collars and dress trims, but if you could afford it an entire lace gown made a statement of your wealth. Below I am wearing a beautiful peach lace evening gown that was worn by a wealthy woman in the 1930s to elegant house parties. Prints were a big deal in the 1930s and not just for house dresses as they had been in the 1920s. Improvements in textile printing meant designs could be printed on almost any kind of fashion fabric available. 1930s prints favored flowers above all else. Small floral in simple, painterly designs resemble arts and crafts styles. Florals became slightly larger as the decade aged, but hardly ever grew beyond 3 inch flowers. Although Art Deco was in full swing, there was little Deco design in fashion prints. There were some repeating geometrics, such as diamonds and squares and of course polka dots. Slightly larger florals were designed with a tropical flair. Prints of the 1930s remained small and dainty. You can use almost any small printed floral fabric to create 1930s clothing. Polka Dots – Dots never go out of style. The 1930s loved them as much as the 1920s, 1940s and 1950s did; however, they did not take center stage over florals. Small white dots on a colored background or colored dots on a white background were the choices. Polka dots were mostly found on accessories such as scarves and gloves. Plaid- Plaid in the form of Tartan plaid, gingham check and windowpane never go out of fashion. 1930s plaid patterns were small prints with 3 colors max. Checks and windowpane were simple two-color patterns with white being one of them. They were mostly used for house dresses and casual frocks and were not especially popular compared to the ’40s and ’50s. 1937 Day Dresses: dots, checks, tweed and plaid. Paisley– When I think of paisley, I think of ’70s men’s shirts in wild swirls of clashing colors. Little did I realize that the 1930s also loved wild paisley patterns. Large paisley was especially popular with dress suits, afternoon frocks and some casual blouses. Color combinations had no limits. – Original fabrics from the 1930s — mostly cotton prints. has a selection of reproduction and inspired ’30s prints you can custom order on cotton or silk. – Another source for new classic vintage inspired prints. I just HAD TO reach out to say I thoroughly enjoyed this!